Stationery & Office Supplies shares that were listed on the Junior Market of the Jamaica Stock Exchange on Thursday traded as high as $5.80 but closed at a record closing high of $5.08 to record a rise of 154 percent at the close. 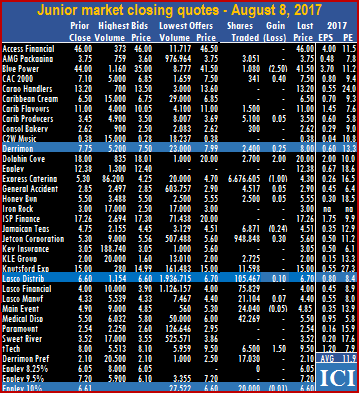 Trading in the Junior Market of the Jamaica Stock Exchange closed on Friday with a number of stocks advancing out pacing those declining 2 to 1. The volume and value of stocks traded rose sharply compared to that on Thursday as Express Catering traded 12.4 million shares and the market index closed higher by 16.57 points to close at 3,149.79 points to close at 3,133.22. The Market index traded 15,732,911 shares valued at $100,160,789.54 compared with 554,002 shares valued at $2,805,282 on the previous day. A total of 25 securities traded compared 18 on Thursday with 9 stocks advancing 5 declining and 11 traded firm. Trading ended with an average of 629,316 units for an average of $4,006,432 in contrast to 30,778 units for an average of $155,849 on Thursday. The average volume and value for the month to date amounts to 210,256 units valued at $1,210,863 compared to 140,412 units valued at $744,935 previously. In contrast, July closed with average of 536,395 units at $1,905,441 for each security traded. At the close of the market, stocks trading and their last traded price are: Access Finance added 50 cents to close at $46.50 with 15,230 shares, AMG Packaging trading 30,000 units at $3.50, Blue Power closed at $41.50 with 12,277 shares, Cargo Handlers closed with a loss of 50 cents at $11 with 6,848 shares, Caribbean Cream closed at $6.80 with 13,080 shares, Caribbean Flavours ended $1.95 higher and closed at $12.95 with 9,503 shares, Caribbean Producers closed at $3.50 with 109,654 shares, Consolidated Bakeries closed at $2.62 with 4,000 shares, Dolphin Cove lost $2.50 and closed at $17.50 with 1,272,104 shares. Express Catering rose 49 cents to $5.50 with 12,431,073 shares, General Accident closed 5 cents higher to $3 with 38,644 shares, Honey Bun dipped 50 cents, to a 52 weeks’ low of $4.50 with 13,400 shares, Jamaican Teas ended 5 cents higher at $4.60 with 3,000 shares, Jetcon Corporation closed 5 cents higher at $5.20 with 124,479 shares, KLE Group closed at $2 with 60,400 shares. 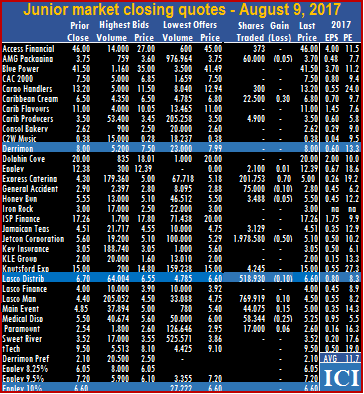 Knutsford Express gained 10 cents and closed at $15 with 6,900 shares, Lasco Distributors closed at $6.70 with 202,957 shares, Lasco Financial closed with 22,593 shares trading at $4, Lasco Manufacturing ended at $4.50 with 8,881 shares, Main Event traded at $5 with 14,253 shares, Sweet River closed 3 cents higher at $3.55 with 2,000 shares, tTech dropped $1.45 to $8.05 with 20,513 shares, Eppley 8.25% preference share closed with a loss of 5 cents at $6 with 400 units and Eppley 9.5% preference share closed at $6.60 with 1,000 shares. Trading in the Junior Market of the Jamaica Stock Exchange closed on Wednesday with a number of stocks declining, out pacing those rising. The volume and value of stocks trading, declined compared to that on Tuesday and the market index closed slightly lower. The Market index declined 6.83 points to close at 3,155.07, with 17 securities trading as 6 stocks advanced 5 declined and 6 traded firm. At the close 3,764,636 shares valued at $19,753,434.21 traded, compared with the 7,982,375 units valued at $43,352,441passing through the market on the previous trading day. Trading ended with an average of 221,449 units for an average of $1,161,967 in contrast to 347,060 units for an average of $1,884,889 on Wednesday. The average volume and value for the month to date amounts to 162,339 units valued at $862,752 compared to 147,562 units valued at $787,949 previously. In contrast, July closed with average of 536,395 units at $1,905,441 for each security traded. 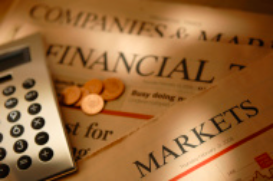 At the close of the market, stocks that were active and their last traded price for the day are: Access Finance closing at $46 with 15,230 shares, AMG Packaging losing 5 cents trading 60,000 units at $3.70, Cargo Handlers closing at $13.20 with 300 shares, Caribbean Cream closing 30 cents higher to $6.80 with 22,500 shares, Caribbean Producers ending at $3.50 with 4,900 shares, Eppley gaining 1 cent, closing at $12.39 with 2,100 shares. Express Catering rose 70 cents and closed at $5 with 201,753 shares, General Accident ended with a loss of 10 cents and closed at $2.80 with 75,000 shares, Honey Bun lost 5 cents, to close at $5.50 with 3,488 shares, Jamaican Teas closed at $4.51 with 3,129 shares, Jetcon Corporation fell 50 cents, close at $5.10 with 1,978,580 shares. Knutsford Express closed at $15 trading 4,245 shares, Lasco Distributors closed with a loss of 10 cents at $6.60 with 518,930 shares, Lasco Manufacturing traded 10 cents higher close at $4.50 with 769,919 shares, Main Event rose 15 cents to $5.00 with 44,075 shares, Medical Disposables lost 25 cents, to close at $5.25 with 58,344 shares and Paramount Trading gained 6 cents to close at $2.60 with 17,000 shares. 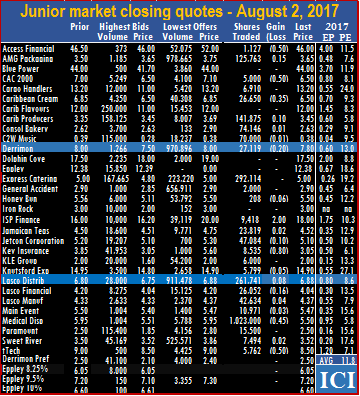 Trading in the Junior Market of the Jamaica Stock Exchange closed on Tuesday with a number of stocks advancing, out pacing those declining. 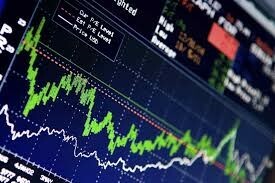 The volume and value of stocks traded climbed compared to that on Friday with the market index closing sharply higher. The market index jumped 53.71 points to close at 3,161.90, as 23 securities traded, up from 19 on Friday with 10 stocks advancing, 5 declining and 8 traded firm. Trading closed with 7 stocks with bids higher than the last traded prices and 1 closing with a lower offer. 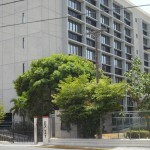 At the close 7,982,375 units value at $43,352,441 traded, compared with 1,948,274 valued at $10,702,346 passing through the market on the previous trading day. Trading was boosted by Express Catering with more than 6.6 million units changing hands. Trading ended trading with an average of 347,060 units for an average of $1,884,889 in contrast to 102,541 units for an average of $563,281 on Friday. The average volume and value for the month to date amounts to 147,562 units valued at $787,949 compared to 81,062 units valued at $422,302 previously. In contrast, July closed with average of 536,395 units at $1,905,441 for each security traded. 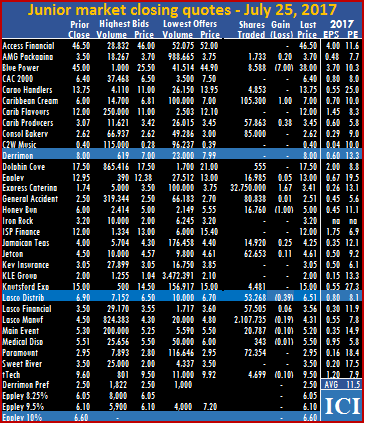 The volume of stocks trading and their last traded prices at the close are: AMG Packaging closing at $3.75 with 3,051 units changing hands, Blue Power dived $2.50 to close at $41.50 with 1,080 units changing hands, CAC 2000 closed at $7.50 with 341 shares, Caribbean Flavours closed at $11 with 1,500 shares, Caribbean Producers closed 5 cents higher at $3.50 with 5,100 shares, Consolidated Bakeries closed at $2.62 with 300 shares, Derrimon Trading ended 25 cents higher to close at $8 with 2,400 shares, Dolphin Cove rose $2 to close at $20 with 2,700 shares, Express Catering traded at a new high during the day at $5.57 but closed $1 lower for the day at $4.30 with 6,676,605 shares, General Accident rose 5 cents and closed at $2.90 with 4,517 shares, Honey Bun gained 5 cents to close at $5.55 with 2,500 units, Jamaican Teas lost 24 cents and closed at $4.51 with 6,871 shares, Jetcon Corporation rose 30 cents to close at $5.60 with 948,848 shares, as investors responded positively to the company’s six month results. 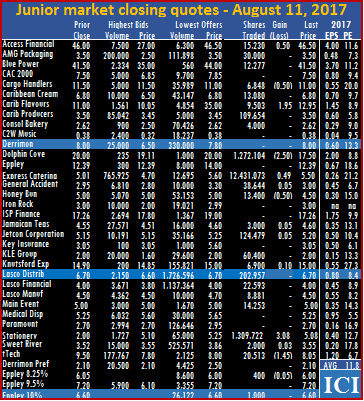 KLE Group closed at $2 with 2,725 shares, Knutsford Express traded 11,598 shares at $15, Lasco Distributors closed 10 cents higher at $6.70 with 105,467 shares, Lasco Financial closed at $4 with 75,829 units, Lasco Manufacturing gained 7 cents to $4.40 with 21,104 shares, Main Event closed down by 5 cents at $4.85 with 24,040 shares, Medical Disposables closed at $5.50 with 42,269 shares, tTech climbed $1.50 higher to close at $9.50 with 6,500 stock units, Derrimon Trading preference share closed at $2.10 with 17,030 units and Eppley 10% preference share ended at $6.60 with 20,000 units after falling 1 cent. Trading on the Junior Market of the Jamaica Stock Exchange closed on Friday with advancing stocks just edging out declining ones and the market index remained almost steady, slipping just 0.69 points to 3,108.19. The market ended with 1,948,274 units valued at $10,702,346 changing hands, compared to Thursday with 1,176,216 units valued at $5,557,230. A total of 19 securities traded, down from 22 on Thursday, with 8 stocks rising and 7 declining. Trading closed with 7 stocks with bids higher than the last traded prices and 4 closing with lower offers. Trading ended trading with an average of 102,541 units for an average of $563,281 in contrast to 53,464 units for an average of $252,601 on Thursday. The average volume and value for the month to date amounts to 81,062 units valued at $422,302 compared to 70,323 units valued at $351,812 previously. In contrast, July closed with average of 536,395 units at $1,905,441 for each security traded. At the close of the market, stocks trading and their last traded prices are: AMG Packaging rose by 22 cents to close at $3.75 with 64,907 units changing hands, CAC 2000 climbed 60 cents higher close at $7.10 with a 18,600 shares, Caribbean Cream with a loss of 35 cents, closed at $6.50 with a 17,300 shares, Caribbean Flavours suffered a loss of $1, to close at $11 with a 250,000 shares, Caribbean Producers closed at $3.45 with a 48,500 shares. Consolidated Bakeries ended with a loss of 33 cents, to $2.62 with a 23,617 shares, Derrimon Trading traded 25 cents higher to $7.75 with a 100,000 shares, Dolphin Cove rose 50 cents to close at $18 with a 700 shares, Express Catering closed 60 cents higher at $5.30 with a 1,158,203 shares, after trading at a low of $3.90 for the day and ended with an offer at $4.50 to sell 13,736 units. 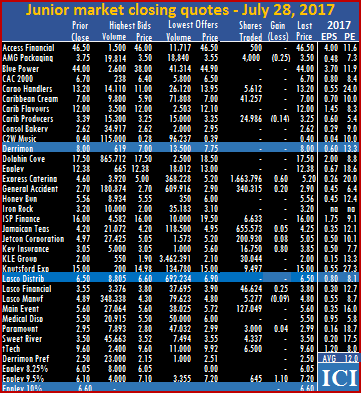 General Accident with a loss of 5 cents, closed at $2.85 with a 2,642 shares, ISP Finance fell $1.16 cents, to close at $17.26 with 120 shares, Jamaican Teas gained 24 cents to $4.75 with a 39,147 shares, Jetcon Corporation close at $5.30 with a 28,500 shares, KLE Group closed at $2 with a 2,390 shares, Knutsford Express fell 1 cent to $15 with a 2,000 shares, Lasco Distributors with a loss of 10 cents, to close at $6.60 with 61,046 shares, Lasco Financial closed at $4 with a 121,709 shares, Main Event lost 49 cents, and closed at $4.90 with a 8,000 shares and Paramount Trading jumped 69 cents higher to close at $2.54 with a 893 shares. 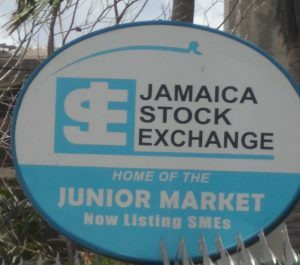 Trading in the Junior Market of the Jamaica Stock Exchange closed on Wednesday with 84 percent of the ordinary listings being active and ending with declining stocks dominating rising ones almost 2 to 1 leading to a small fall in the market index. At the close the volume of stocks and value of stocks traded, fell by a half of Monday levels. The market ended with 2,266,721 units valued at $11,726,592 changing hands, with the index falling 6.26 points to close at 3,149.20. On Monday, trading closed with 4,581,201 units valued at $21,905,678. A total of 26 securities traded, versus 22 on Monday, with 8 stocks rising and 13 declining. Trading closed with 4 stocks having bids higher than the last traded prices and 1 closing with a lower offer. Trading ended trading with an average of 87,182 units for an average value of $451,023 in contrast to 208,236 units for an average value of $995,713 on Friday. In contrast, July closed with averages of 536,395 units valued at $1,905,441 for each security traded. At the close of the market, stocks trading and their last traded price are Access Financial Services closing with a loss of 50 cents at $46, in trading 1,127 units, AMG Packaging rose 15 cents to close at $3.65 with 125,763 units changing hands, CAC 2000 fell 50 cents with 5,000 shares trading to end at $6.50, Cargo Handlers ended trading with 6,910 shares to close at $13.20. 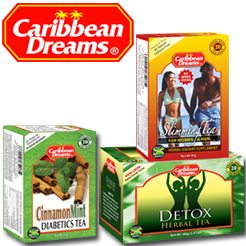 Caribbean Cream ended trading at $6.50 with a 35 cents loss, after trading 26,650 shares, Caribbean Producers added 10 cents to close trading with 141,875 units, at $3.45, Consolidated Bakeries rose 1 cent and ended with 74,146 units changing hands, at $2.63. C2W Music had 70,000 units changing hands, to close at 38 cents, after falling 1 cent, Derrimon Trading declined by 20 cents to end at $7.80 after with 27,119 shares changing hands. Recently listed Express Catering ended at $5 with 292,114 shares changing hands, after the company announced a dividend of 0.917 US cent per share, General Accident closed trading with 2,000 shares at $2.90, Honey Bun fell 6 cents with 208 shares changing hands at $5.50, ISP Finance closed $2 higher with 9,418 units changing hands at $18, Jamaican Teas rose 2 cents, trading 23,819 shares to close at $4.52, Jetcon Corporation traded 47,084 shares to end at $5.10, after slipping 10 cents, Key Insurance traded 8,535 units to close at $3.05 after losing 80 cents, KLE Group ended at $2 with 6,000 shares changing hands, Knutsford Express lost 5 cents in trading 5,799 shares to end at $14.90, Lasco Distributors closed with a rise of 8 cents at $6.88, after trading 261,741 units, Lasco Financial lost 16 cents and ended with 26,052 shares changing hands at $4.04, Lasco Manufacturing rose 4 cents and ended with 42,634 shares trading at $4.37, Main Event eased 3 cents to close with 10,971 shares trading at $5.47, Medical Disposables dropped 45 cents in closing at $5.50 with 1,023,000 units trading, Paramount Trading ended with 15,500 units changing hands at $2.50, Sweet River rose 2 cents, ending with 7,494 units changing hands at $3.52 and tTech lost 50 cents in trading 5,762 units to close at $8.50. Trading in the Junior Market of the Jamaica Stock Exchange closed on Monday with a number of stocks declining just edging out those rising and led to a small fall in the market index. 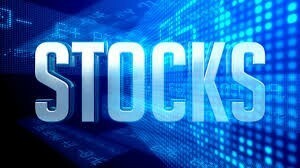 At the close the volume of stocks and value of stocks traded increased compared to that on Friday. Trading ended with 4,581,201 units valued at $21,905,678 changing hands, with the market index falling 7.65 points to close at 3,155.46. On Friday, trading closed with 3,193,325 shares changing hands valued at $14,765,053. 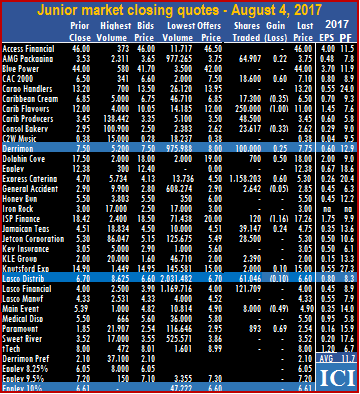 A total of 22 securities traded, versus 20 on Friday with 7 stocks gaining and 8 declining and trading closed with 10 stocks having bids higher than the last traded prices and 2 closing with lower offers. 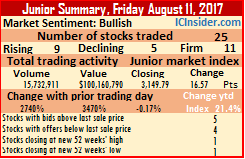 The Junior Market ended trading with an average of 208,236 units for an average value of $995,713 in contrast to 159,666 units for an average value of $738,253 on Friday. The average volume and value for the month to date amounts to 536,395 units valued at $1,905,441 compared to 552,021 units valued at $1,948,762 previously. In contrast, June closed with averages of 395,969 units valued at $1,799,200 for each security traded. 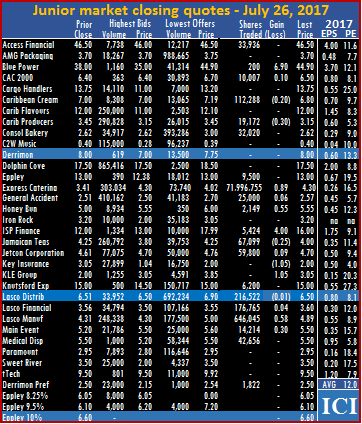 At the close of the market, stocks trading with their last traded prices are: AMG Packaging closed at $3.50 with 18,840 units changing hands, CAC 2000 traded 30 cents higher to $7 with a 32,193 shares being exchanged, Caribbean Cream had a loss of 15 cents, to close at $6.85 with a 731,500 shares trading, Caribbean Flavours closed at $12 with a 3,500 shares trading, Caribbean Producers rose 10 cent to $3.35 with a 618,208 shares traded, Consolidated Bakeries closed at $2.62 with a 15,000 shares being exchanged. C2W Music shed 1 cent to close at 39 cents with a 8,000 shares being switched, Express Catering fell 20 cents and closed at $5 with 1,302,903 shares being swapped,General Accident closed at $2.90 with a 61,215 shares traded, Honey Bun closed at $5.56 with a 2,000 shares changing hands. 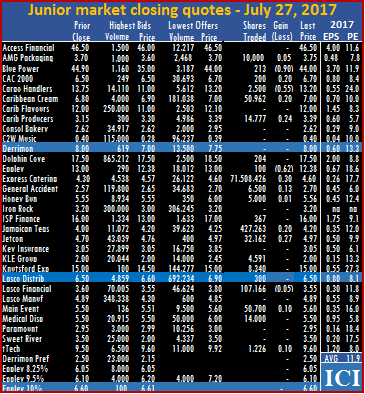 Iron Rock Insurance ended trading with a loss of 20 cents, at $3 with a 327,174 shares traded, ISP Finance closed at $16 with a 4,582 shares being traded, Jamaican Teas closed 25 cents higher to $4.50 with a 12,000 shares changing hands, Jetcon Corporation traded 15 cents higher, to close at $5.20 with a 442,571 units being swapped. 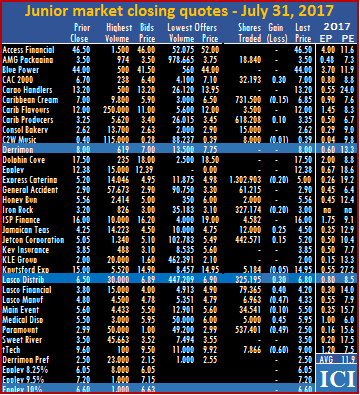 Knutsford Express declined 5 cents, to close at $14.95 with a 5,184 shares switching owners, Lasco Distributors traded 30 cents higher to close at $6.80 with 325,195 shares changing owners, Lasco Financial rose 40 cents in trading 79,365 units to close trading at $4.20, Lasco Manufacturing traded with a lost 47 cents, and ending at $4.33 with a 6,963 shares being transferred, Main Event declined by 10 cents to close with 34,541 shares trading, to close at $5.50. Medical Disposables closed 45 cents higher at $5.95 with a 5,000 shares traded, Paramount Trading lost 49 cents to close at $2.50 with a 537,401 shares changing hands after the company posted a sharp fall in profits for the year to May and tTech lost 6 cents and closed at $9 with 7,866 shares trading. 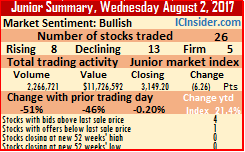 Trading in Express Catering shares declined sharply lower on the Junior Market on Friday, with just 1,663,796 units trading compared to 71,508,426 units traded on Thursday. The stock climbed 60 cents to close at a record of $5.20 with 368,228 on the offer at the closing price. There is still a large number of bids to buy the stock in the high $4 range up to $5. At this price its valued at 20 times estimated 2018 earnings. Based on the behaviour of investors in Main Event it could well be pushed higher and then settle back lower, only time will tell. 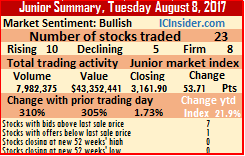 Trading elsewhere on the Junior Market remained subdued on Friday with 3,193,325 shares changing hands valued at $14,765,053, from 72,244,997 shares valued at $309,765,128 traded on Thursday. At the close, the market index rose 36.68 points to 3,163.11. 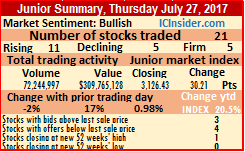 Twenty (20) securities traded, versus 21 on Thursday with 7 stocks gaining and 3 declining and closed with 3 stocks having bids higher than the last traded prices and 4 closing with lower offers. 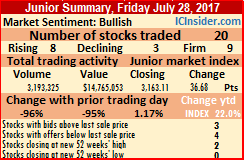 The Junior Market ended trading with an average of 159,666 units for an average value of $738,253 in contrast to 3,440,238 units for an average value of $14,750,720 on Thursday. The average volume and value for the month to date amounts to 552,021 units valued at $1,948,762 compared to 571,639 units valued at $2,009,287 previously. In contrast, June closed with averages of 395,969 units valued at $1,799,200 for each security traded. 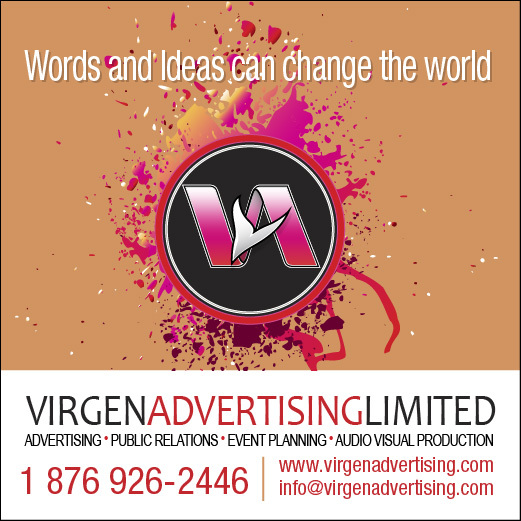 At the close of the market, Access Financial Services closed at $46.50 in trading 500 units, AMG Packaging fell 25 cents and closed at $3.50 with 4,000 units changing hands, Cargo Handlers ended trading 5,612 shares to close at $13.20, Caribbean Cream ended trading at $7, after trading 41,257 shares, Caribbean Producers shed 14 cents to close trading with 24,986 units, at $3.25, General Accident added 20 cents, closing trading with 340,315 shares at $2.90, ISP Finance closed with 6,633 units changing hands at $16, Jamaican Teas rose 20 cents in trading 655,573 shares to close at $4.25, Jetcon Corporation traded 200,930 shares to end at $5.05, after gaining 8 cents, Key Insurance traded 16,750 units to close at $3.85 after rising 80 cents, KLE Group ended at $2 with 30,044 shares changing hands, Knutsford Express traded 9,497 shares to end at $15 Lasco Financial rose 25 cents and ended with 46,624 shares changing hands at $3.80, Main Event gained 10 cents to close with 127,049 shares trading at $5.60, Paramount Trading rose 4 cents and ended with 3,000 units changing hands at $2.99, tTech traded 6,500 units to close at $9.60 and Eppley 9.5% preference share jumped $1.10 to close at a 52 weeks’ high of $7.20, with 645 units trading. Investors traded 71.6 million of Express Catering shares in Junior Market activity on Thursday. The day’s trade brings the total since the company’s shares were listed in the previous week, to 176,255,281 units, a very high 54 percent of the 327,500,000 units sold in the Initial Public Offer (IPO). “A number of the large investors in the stock who had planned to hold them for a while, decided to take profit in light of the sharp uptick in the stock price,“ Gary Peart of Mayberry Investments, brokers to the IPO, advised IC Insider.com. 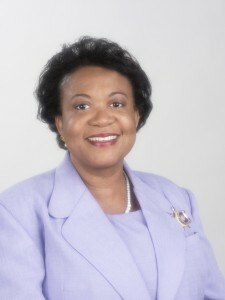 Peart also stated that there was strong institutional demand for the stock as well. The stock traded over 70 million units for the second day running having traded 71,996,755 units on Wednesday. Express Catering’s stock price closed with a rise of 30 cents to end at a record closing high of $4.60 with 71,508,426 units traded. 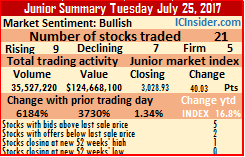 Trading on the Junior Market remained high on Thursday with 72,244,997 shares changing hands valued at $309,765,128, from 73,477,574 shares valued at $263,785,025 traded on Wednesday. At the close, the market index rose 30.21 points to 3,126.43. A total of 21 securities traded, versus 20 on Wednesday with 11 stocks gaining and 5 declining and closed with 3 stocks having bids higher than the last traded prices and 4 closing with lower offers. The Junior Market ended trading with an average of 3,440,238 units for an average value of $14,750,720 compared to 3,673,879 units for an average value of $13,189,251 on Wednesday. The average volume and value for the month to date amounts to 571,639 units valued at $2,009,287 compared to 420,660 units valued at $1,338,685 previously. In contrast, June closed with averages of 395,969 units valued at $1,799,200 for each security traded. At the close of the market, AMG Packaging rose 5 cents and closed at $3.75 with 10,000 units changing hands, Blue Power fell 90 cents, to close at $44 with only 213 units changing hands, CAC 2000 rose 20 cents with 200 shares trading to end at $6.70, Cargo Handlers shed 55 cents and ended trading 2,500 shares to close at $13.20, Caribbean Cream rose 20 cents, closing trading with 50,962 units at $7, Caribbean Producers gained 24 cents to close trading with 14,777 units, at $3.39, Dolphin Cove ended at $17.50 with 204 shares changing hands, Eppley lost 62 cents in trading 100 shares at $12.38, General Accident added 13 cents and closed trading with 6,500 shares at $2.70, Honey Bun gained 1 cent with 5,000 shares changing hands and closed at $5.56, ISP Finance closed with 367 units changing hands at $16, Jamaican Teas rose 20 cents in trading 427,263 shares to close at $4.20, Jetcon Corporation traded 32,162 shares to end at $4.97, after gaining 27 cents, KLE Group ended at $2 with 4,591 shares changing hands, Knutsford Express traded 8,340 shares to end at $15, Lasco Distributors closed at $6.50 after trading 300 units, Lasco Financial lost 5 cents and ended with 107,166 shares changing hands at $3.55, Main Event gained 10 cents to close with 50,700 shares trading at $5.60, Medical Disposables closed at $5.50 with 14,000 units trading and tTech traded 1,226 units, rising 10 cents to close at $9.60. Wednesday was the biggest day of trading in Express Catering since it listed last Friday on the Junior Market, the stock closed with an 89 cents rise to a record closing high of $4.30 with a massive 71,996,755 units trading out of a total of 73.5 million shares that traded in the market. Express Catering’s stock price is up 187 percent from the IPO price of $1.50 so far, the stock closed with the bid at $4.30 to buy 303,034 units. 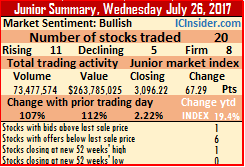 Trading on the Junior Market jumped sharply on Wednesday to 73,477,574 shares valued at $263,785,025 up from 35,527,220 shares valued at $124,668,100 traded on Tuesday. At the close, the market index rose 67.29 points to 3,096.22. At the close 20 securities traded, down from 21 on Tuesday with 11 stocks gaining and 5 declining. Trading closed with 1 stock having a higher bid than the last traded price and 6 closing with lower offers. 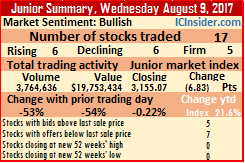 The Junior Market ended trading with an average of 3,673,879 units for an average value of $13,189,251 compared to 1,691,772 units for an average value of $5,936,576 on Tuesday. The average volume and value for the month to date amounts to 571,639 units valued at $2,009,287 compared to 239,926 units valued at $680,321 previously. In contrast, June closed with averages of 395,969 units valued at $1,799,200 for each security traded. At the close of the market, Access Financial Services closed at $46.50 in trading 33,936 units, Blue Power rose $6.90 after diving $11 on Monday and Tuesday, to close at $44.90 with only 200 units changing hands, CAC 2000 lost 20 cents with 10,007 shares trading to end at $6.50, Caribbean Cream fell 20 cents and closed trading with 112,288 units at $6.80, Caribbean Producers fell 25 cents to close trading with 19,172 units, at $3.15, Consolidated Bakeries ended with 32,020 units changing hands, to close at $2.62. Eppley closed trading with 9,500 shares at $13, General Accident added 6 cents and closed trading with 25,000 shares at $2.57, Honey Bun gained 55 cents with 2,149 shares changing hands and closed at $5.55, ISP Finance jumped $4 and closed with 5,424 units changing hands at $16, Jamaican Teas lost 25 cents in trading 67,099 shares to close at $4, Jetcon Corporation traded 59,800 shares to end at $4.70, after gaining 9 cents, Knutsford Express traded 6,200 shares to end at $15, Lasco Distributors closed 1 cent lower at $6.50 after trading 216,522 units, Lasco Financial rose 4 cents and ended with 176,765 shares changing hands at $3.60, Lasco Manufacturing grew 58 cents and ended with 646,045 shares trading at $4.89, Main Event gained 30 cents to close with 14,214 shares trading at $5.50, Medical Disposables closed at $5.50 with 42,656 units trading and Derrimon Trading preference share ended with 1,822 units changing hands to close at $2.50. 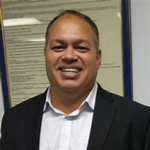 Marlene Street Forrest – General Manager of the JSE is said to have intervened to reset the price Express Catering could trade at on Tuesday. Good sense prevailed on the Jamaica Stock Exchange on Tuesday, finally allowing Express Catering to trade close to levels that large number of investors are prepared to trade the stock. In the process the price jumped 96% from Friday’s closing price and 127 percent from the IPO price of $1.50. At the close on Monday, bids in the market above $2.29 were cancelled, an indication that the maximum price it could trade at being $2.97. IC Insider.com understands that regulations at the exchange permitted administrative intervention in the trading restriction that allowed the stock to enjoy the revised permitted price range of $2.52 to $3.41. 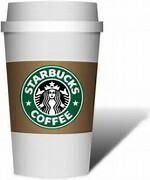 The stock ended up trading 32,750,000 units to close with a gain of $1.67 to $3.41. During trading, the electronic board, showed that 65.6 million units traded up to $3.80. After the market closed a large portion were cancelled since the price exceeded the limit set for the day. The stock closed with the bid at $3.50 which will allow it to trade up $4.55 on Wednesday. Trading on the Junior Market jumped sharply on Tuesday with the large trade in Express Catering, to 35,527,220 shares valued at $124,668,100, up from 1,438.180 shares valued at $7,648,204 traded on Monday. At the close, the market index rose 40.03 points to 3,028.93. At the close, 21 securities traded, up from 17 on Monday with 9 stocks gaining and 7 declining. Trading closed with 5 stocks having a higher bids than the last traded price and 2 closing with lower offers. The Junior Market ended trading with an average of 1,691,772 units for an average value of $5,936,576 compared to 84,599 units for an average of $449,894 on Monday. The average volume and value for the month to date amounts to 239,926 units at $680,321, compared to 74,820 units valued at $371,129 previously. In contrast, June closed with averages of 395,969 units valued at $1,799,200 for each security traded. At the close of the market, AMG Packaging rose 20 cents and closed at $3.70 with 1,733 units changing hands, Blue Power dived $7 after falling $ 4 on Monday to close at $38 with 8,588 units changing hands, Cargo Handlers ended trading 4,853 shares to close at $13.75, Caribbean Cream jumped by $1 and closed trading with 105,300 units at $7, Caribbean Producers gained 38 cents to close trading with 57,863 units, at $3.40, Consolidated Bakeries ended with 85,000 units changing hands, to close at $2.62. Dolphin Cove ended at $17.50 with 555 shares changing hands, Eppley gained 5 cents and closed trading with 16,985 shares at a new high of $13, General Accident added 1 cent and closed trading with 80,838 shares at $2.51, Honey Bun plunged $1 with 16,760 shares changing hands and closed at $5, ISP Finance slipped $2 and closed with 23,500 units changing hands at $12, Jetcon Corporation traded 62,653 shares to end at $4.61, after gaining 11 cents, Knutsford Express traded 4,481 shares to end at $15, Lasco Distributors closed 39 cents lower at $6.51 after trading 53,268 units, Lasco Financial rose 6 cents and ended with 57,505 shares changing hands at $3.56, Lasco Manufacturing shed 19 cents and ended with 2,107,735 shares trading at $4.31, Main Event lost 10 cents to close with 20,787 shares trading at $5.20, strong> Medical Disposables lost 1 cent in ending at $5.50 with 343 units trading, Paramount Trading ended with 72,354 units changing hands at $2.95 and tTech traded 4,699 units, falling 10 cents to close at $9.50.